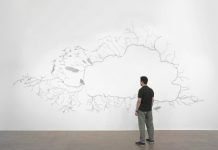 Home Spotlight on the Arts Artists Watching paint dry | Do different climates affect painting? Watching paint dry | Do different climates affect painting? I like art and I like to travel. While noticing art in my travels around the world, I’m always amazed at how the environment and culture inspires one’s pieces. Lake Tahoe draws many artists and in knowing some artists who paint here, it has made me wonder: How fast does paint dry in Lake Tahoe compared to other places? 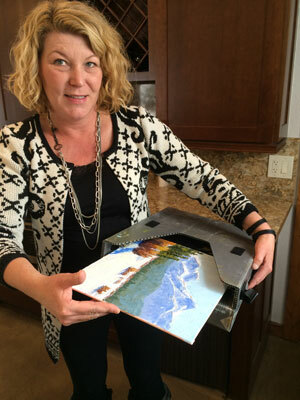 Monika Piper Johnson shows how her paintings fit into a special wood panel carrier after painting on location. 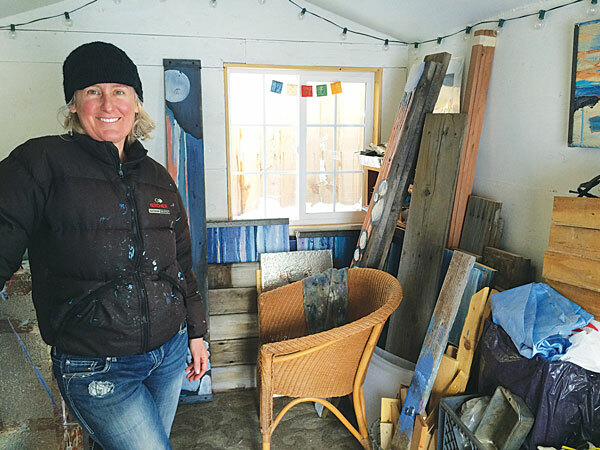 It is a cool, sunny winter day in Lake Tahoe and local artist Monika Piper Johnson is inside Incline Village’s Cobalt Artist Studio workshop. A clean, wooden table is in the middle of studio with paints and art pieces off to the side. A heater is in place with a ceiling fan turned on, helping to circulate the air. 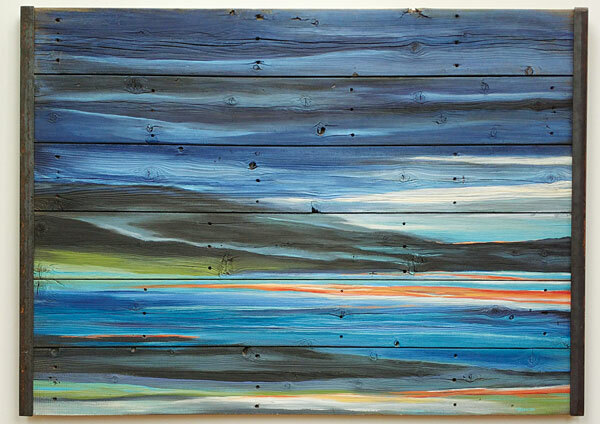 Johnson has been painting abstracts, landscapes and still life for more than 17 years in North Lake Tahoe. Using oil paints as her preferred medium, she likes to capture scenes on-location. 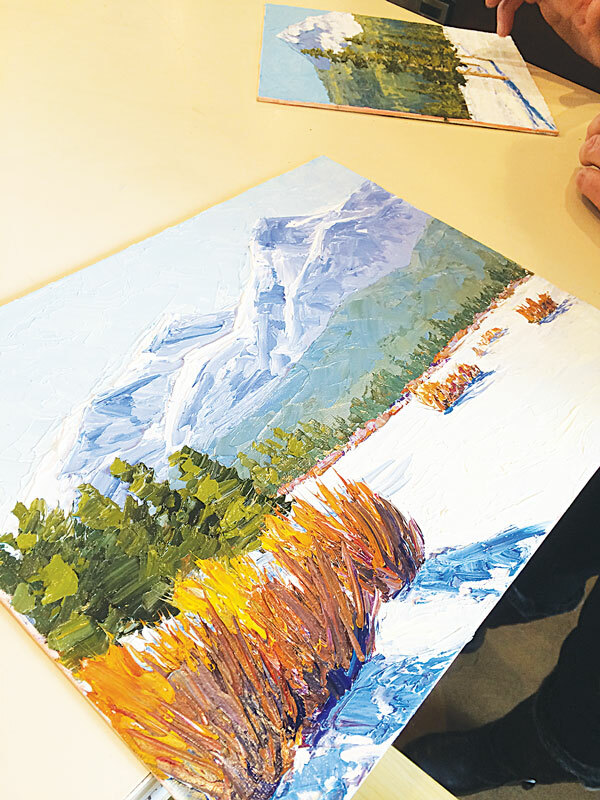 Johnson has experience painting in Virginia City, Mammoth, Montana, Wyoming and Alaska, where she says her work has a similar drying time to Lake Tahoe. However, she has also painted in Carmel, Mendocino, France, Bermuda and Russia where the process is different. Monika Piper Johnson shows how the layers of oil paint dries in one of her art pieces. What type of material an artist paints on, the size of it and the medium used affects the drying time, as well. Johnson finds that some colors, thicknesses and brands of oil paint take longer to dry. “Sap green is the slowest,” she says. The amount of pigments a paint color has may affect the drying time, but the bigger a painting is, the longer it takes to dry, as well. Johnson says that painting on location also takes longer because the light is constantly changing. Johnson admits that when she’s finished painting on location and wants it to dry faster, she’ll put it on the car dashboard over the defroster. She’ll also mix a fast dry alkyd medium in with her paint to further protect an artwork. I poke at one of her paintings called “Thunderbird Lodge Gazebo” that she finished a month ago. It is dry to the touch, but thick and kind of buoyant. “I learned how to manipulate temperatures to get the right texture,” she says. I meet with Kings Beach artist Mary Beth Hamilton. Painting on reclaimed cedar wood pier planks she gets from a neighbor, Hamilton approaches her artwork from a different angle and hadn’t considered the timeline of a painting until now. Mary Beth Hamilton in her studio. “Painting is such a timeless thing for me, I don’t think about how fast paint dries because of the creative flow.” She says that she has a different sensibility regarding her process; sometimes she wants a work of art to hurry up and dry so she can paint over it and other times she waits a couple of days to readjust her mental state before adding another layer. 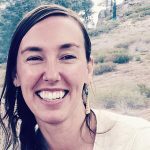 Hamilton studied art at Sonoma State University and has worked with different mediums in the last 20 years. 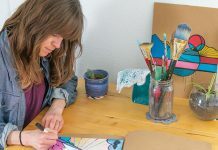 She has experimented with ceramic sculptures, oil pastels, silk painting and even wood carving, but now her preferred process is taking different colors of house paint to reclaimed pier wood. Mary Beth Hamilton’s custom-made art cart. 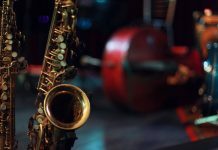 But in getting back to how the old dried out wooden planks react with her preferred medium, she says that the “thirsty old wood just drinks up the paint,” so she goes through a lot of it. She likes using house paint because it’s cheaper than buying tubes of acrylic and it’s easier to use for bigger pieces. “Sometimes I’ll just put one layer on and it’s done, but then other pieces take 47 layers,” she says. “Art takes a lifetime of learning and experimenting. The learning curve has been steep with how paint dries and how the wood reacts with it,” she says. It’s no secret that a cold, dry painting environment can provide some challenges when trying to keep paints intact. Unless you can keep a studio heated, paint may freeze and have to be thrown out. To keep her paint from drying out, Johnson will spread it out on a plate, cover it with saran wrap, and stick it in the freezer. That way it stays cold and isn’t exposed to air. 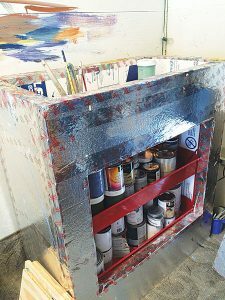 To keep her paint from freezing, Hamilton bought a rolling cart from Harbor Freight, wrapped it in foil and foam insulation and then inserted little lights and a thermostat in it. “I didn’t consider paint freezing when we first built this shed, but I lost a lot in that first winter,” she says.